OL2 Yorkshire Dales - Southern and Western Areas. 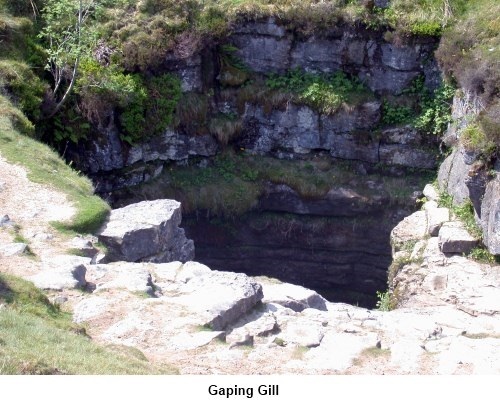 Introduction: There are a number of different ways to climb Ingleborough but this is the best and takes in its most interesting features Ingleborough Cave, Trow Gill, Gaping Gill, Ingleborough itself, the limestone outcrops at Sulber Nick and the magnificent limestone of Moughton Scar. One point to bear in mind is that Ingleborough frequently has a cap of cloud. The top of Ingleborough is a strangely disorientating place in cloud/mist and you are strongly urged to take a compass with you just in case. The walk starts in the village of Clapham where there is a car park but if you are lucky, you might get parked on the main street. To get to Clapham, approach on the A65 from whichever direction and turn off to the north east side on the B6480. From the NW, turn left as you face the New Inn or from the SE, turn right when you get to it. 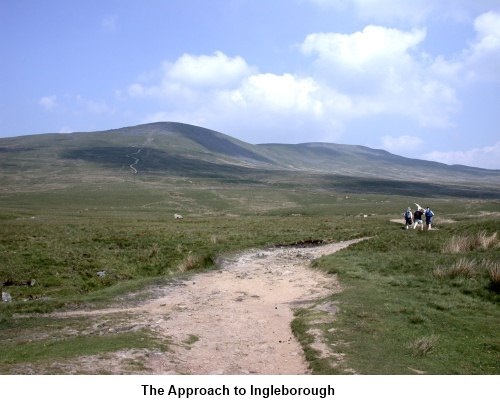 An alternative route up Ingleborough is Ingleborough from Ingleton. Start: Cross the beck by the footbridge and turn right along Riverside and left at the sharp bend at the top on to Old Road (SD 746695) A short distance along here, look out for a finger post signed Ingleborough Cave, Gaping Gill and Ingleborough and take this track. At the end of some trees, the track forks and you take the right hand fork with Clapdale wood on your right. The track forks again, the left fork being a walled lane but you want the right fork again to Clapdale Farm. Through the farm (SD 751709), turn right until you join the main track Clapdale Drive close to Clapham Beck and turn left. 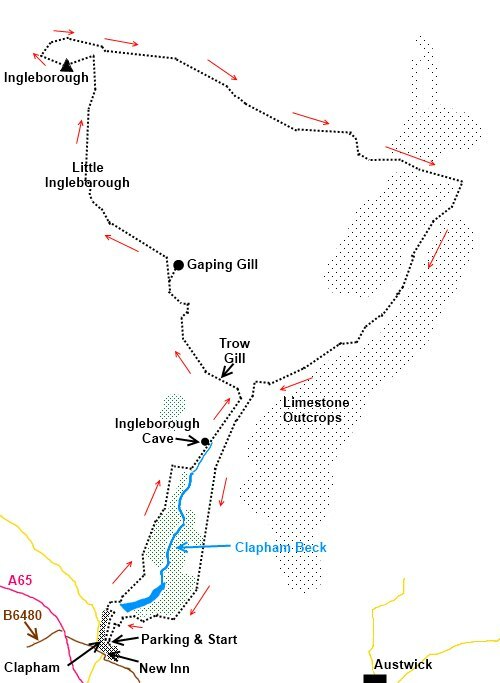 Follow this track and you will come to Ingleborough Cave. If you wish to see the cave (open February to October), there is a charge. It has been showing tourists round for over 170 years. Stay on the main track for about 0.3 of a mile at which point the track turns sharply left (SD 758715). 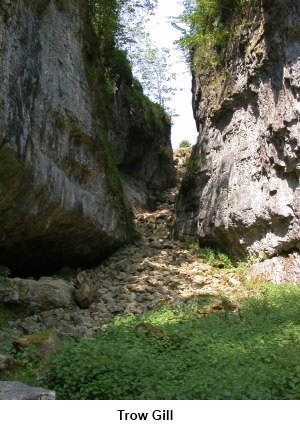 Go through a gate (or over the stone step stile beside) and proceed ahead to the dramatic limestone gorge of Trow Gill. The path goes through the Gill and there is a short easy scramble at the end, at which point you get the first views of Ingleborough itself. Once out of the Gill, the path follows the line of a wall then over a double stile and on to the open fell. Stay on the main rising track until it forks (SD 751725). Here to the right is a worthwhile diversion to Gaping Gill. Fell Beck drops into the abyss. Be sure you do not do the same! It plunges down for 100 metres. At certain times of the year, notably spring Bank Holiday, the Bradford Pothole Club set up a winch to lower the public down. There is a charge. Having cautiously inspected Gaping Gill, return to the main track (there is a path which cuts the corner off) and turn right. Now begins the steep part of the walk first up Little Ingleborough then Ingleborough itself. 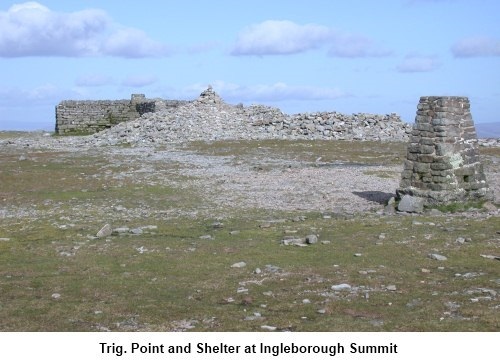 As you reach the edge of the summit plateau (SD 745747), turn left (SW) to reach the trig. point and cross shaped shelter (SD 741746). From here, rather than heading straight back to the track, if it is a clear day, it is worth heading roughly NW to the edge of the plateau (in effect continuing in the same direction at which you approached the shelter) and turn right following it along to marvel at the view.  You will rejoin the main path at SD 745747. If it is foggy do not do this but set your compass from the trig. point (set the bezel on the compass to 70° and follow the direction arrow - see my Finding Your Way page for advice on using the compass if you are in doubt) to return to the point where you joined the plateau. Turn left to get to SD 745747 – only about another 100 yards. 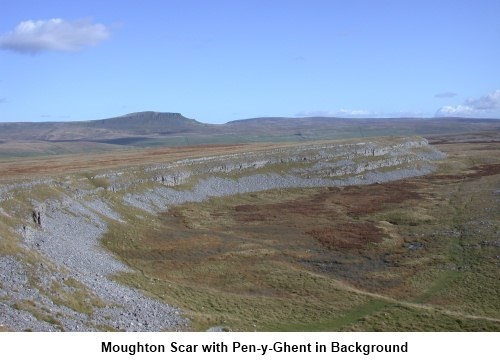 Look out for the footpath descending in a NE direction and where it forks when descending a cobbled section, take the right fork in a just south of easterly direction, heading towards Pen-y-Ghent. After almost a mile, cross a wall via a double stile, the track gradually converges on a wall from the left. Follow it along past the remains of an old shooting lodge (SD 767740). You go through a gate at the next wall and the path soon forks. Take the left fork. The path narrows as it passes between boulders and the wall. Go through another gate. At a 4 way finger post (SD 778735) signed Pennine Bridleway and Clapham 3.5 miles, turn right. Follow the path to a gate in a wall and as you pass through this, look to your left through another gate to see Moughton Scar which is actually quite something. Continue along the track and go right at the next fork (SD 772725). At the next fork (SD 768720) go right again. The path just misses the right angle corner of two walls (SD 763718) and then goes through a gate. You should now see the trees lining Trow Gill at the other side of the valley. Continue descending on the obvious track down the left (SE) side of the Clapham Beck valley. It becomes a walled lane. At the junction of walled lanes at the cormer of a wooded area, turn right. The lane leads back to Clapham through two tunnels. A refreshing pint can be had at the New Inn!